Bitter~Sweet ™: Blood Sugars Be Damned . . .
some times you just NEED a good cupcake. 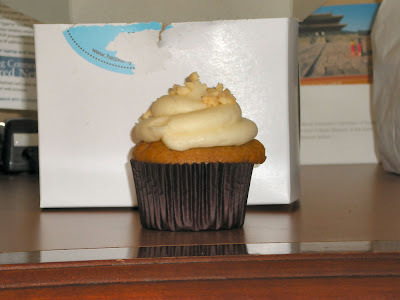 More on where and when these cupcakes were found in a future post. Happy Wednesday! Haha. You would LOVE NYC - we have cupcakes galore here. What kind is this? Did you know there's a cupcake van that drives around in Fairfield County? I've yet to see it, but I hear the desserts are delish!! Yummy yummy!!! Specially in My tummy! Hope you enjoyed every last crumb!